The first indication that anything was amiss was a slight rustling in the woods. 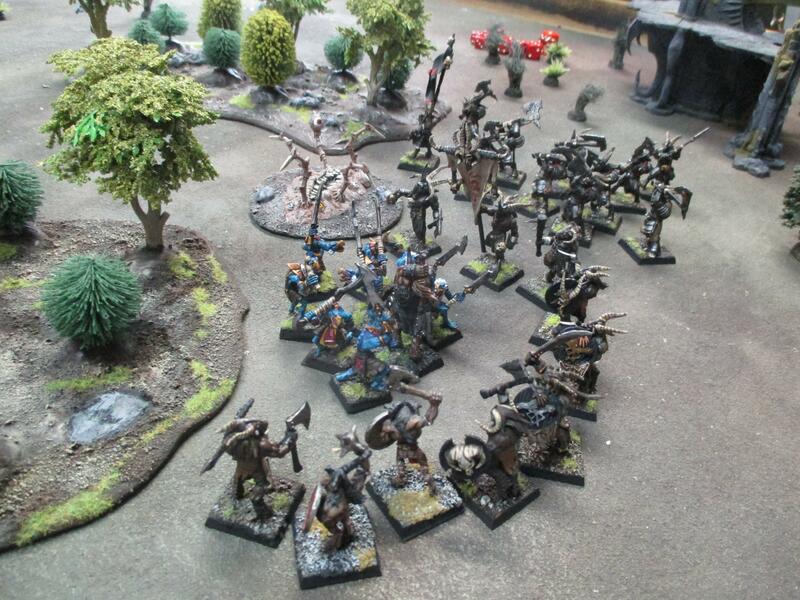 That slight swishing sound of leaves being moved aside only presaged the howling war cries by a moment or two and then the beastmen were upon them. It was not much time to react but it was enough for Magach's followers to move to intercept the threat from harming their master. Magach looked at his interlocutor as the braying broke out all around him. A wave of malevolence passed over his face. "You have betrayed us, shaman and for that you will pay with your life," the sorcerer screamed as his rail thin arms and elongated fingers traced strange passages in the air, the common tongue was lost to his mouth as dark syllables passed over the yellowing teeth coalescing in the air into intangible and transparent shapes at first before they crackled and became first translucent and then solid being. The creatures sprung from the air and landed away from the sorcerer cackling and gibbering. Magach had his own problems though as he looked past the groundmaw and at the onrushing attackers. Ghaka had found him out and now he and his almost ally would either have to slay the Beastlord and most of his Brayherd or be slain by him. Perhaps both events would occur. A lone warrior barrels into Magach's Tzaangors, his massive axe weaving through the air like a bird and with each stroke one of the mutated beastmen falls before it. 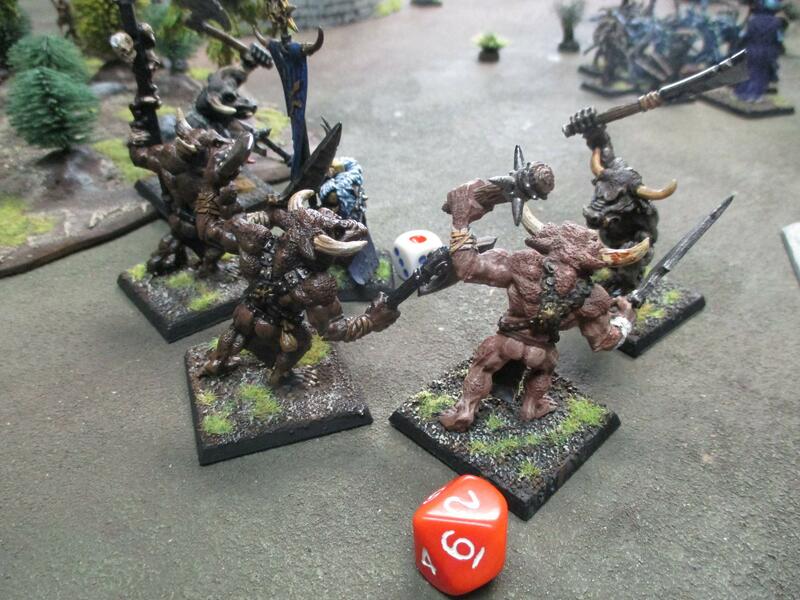 He dances out of their clumsy attacks, all they are doing is slowing the young and powerful Beastman down. His own warriors stand back just watching the spectacle as the champion sidesteps attacks taking the hands, arms or heads from the would-be assailant. But he is showing off and that is giving Magach the time he needs. His braying has not ceased and he stiffens as the last few bleats leave his mouth. He is slightly lifted off of the ground as a force tugs at his lungs. The sensation is entirely unpleasant as he can't breath momentarily as most of the air is ripped from his body. The mucus and fluids start to expand and move upward until there are ten large drops that fall down to the earth. In between Magach, now collapsed on the ground and recovering his breath, and his assailants the giant iridescent drops splash down and from each emerges a reality defying horror. 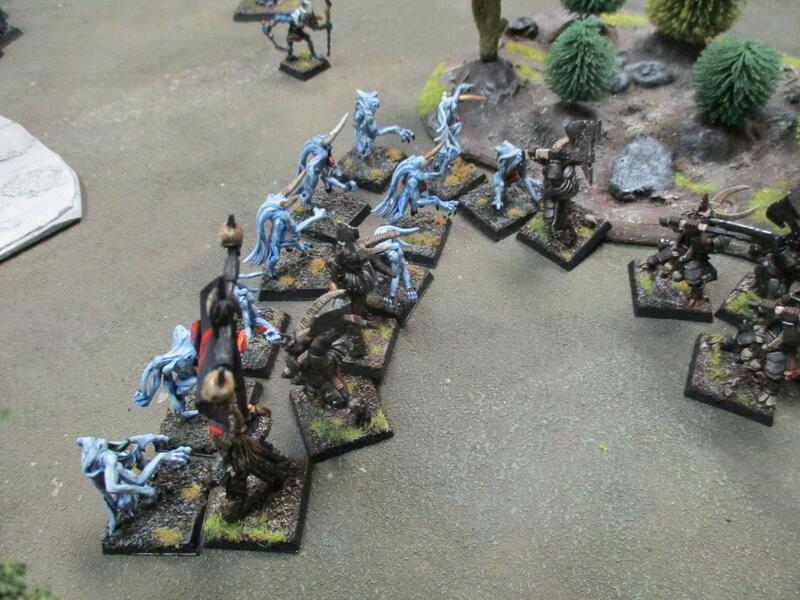 They titter and screech as magic fire erupts from their fingers flying towards the beastmen running towards them. It is not enough to stop the enemy and soon axes are singing songs of destruction as they reap their way through the fragile daemons. Magach pulled himself to his feet and backed up, only to hear a bellowing from his right. Smashing through the trees was a massive one-eyed creature. The eye glowed with baleful light in the twilight under the canopy of trees. The massive chunk of masonry in the creatures hand was hurled with uncanny accuracy by the beast and Magach dove aside, trading his shamanly dignity for his life. The masonry shattered into pieces as it struck the wall behind Magach. From the other side of the wall Magach could hear a savage grunting and the sound of metal on metal, more importantly the crashing sound of metal being rent asunder by metal. 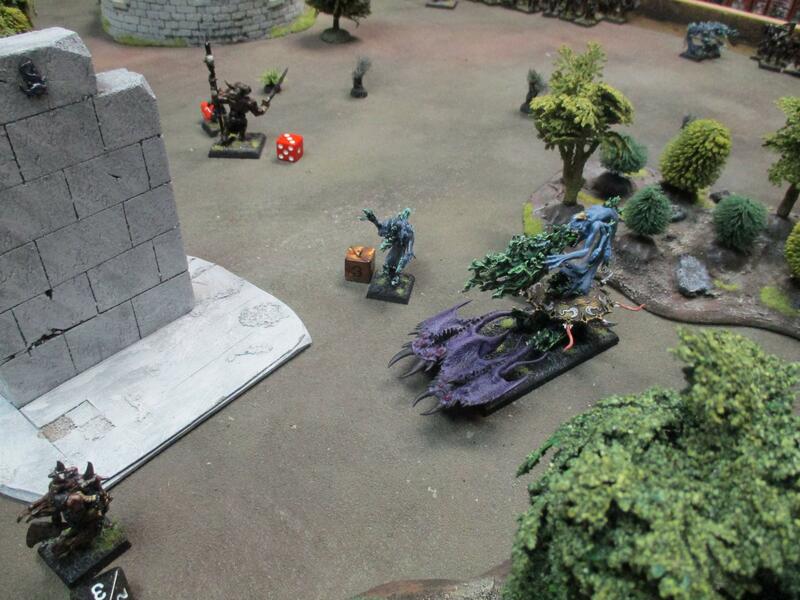 The beast was momentarily distracted by daemons in front of him and Magach chanced a look around the ruined wall. 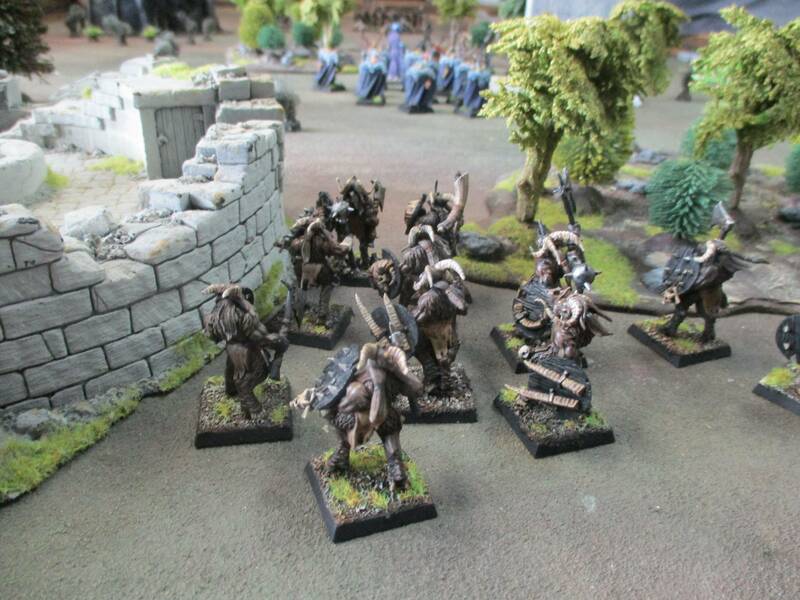 Several bullgors had surrounded the last of the sorcerer's warrior bodyguard and were pulling its armour off before tearing chunks off of the man where flesh became exposed. 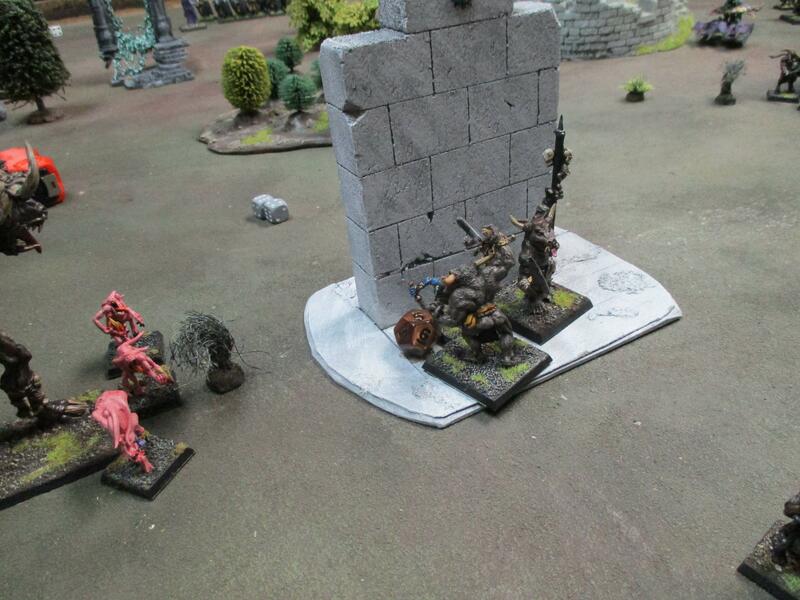 Their muzzles covered in blood they looked up to see the shaman just before he ducked back around the wall. He looked behind him and saw that the horrors had disengaged from the fight and that the creature was aiming another massive missile at him. He twisted to try to get out of the path but was not quite agile enough and the massive stone caught the shaman a glancing blow that sent him tumbling into the wall. He had just stood up when the first of the bullgors peered around the corner, blood dripping from the sharp fangs incongruosly housed in the bovine face. 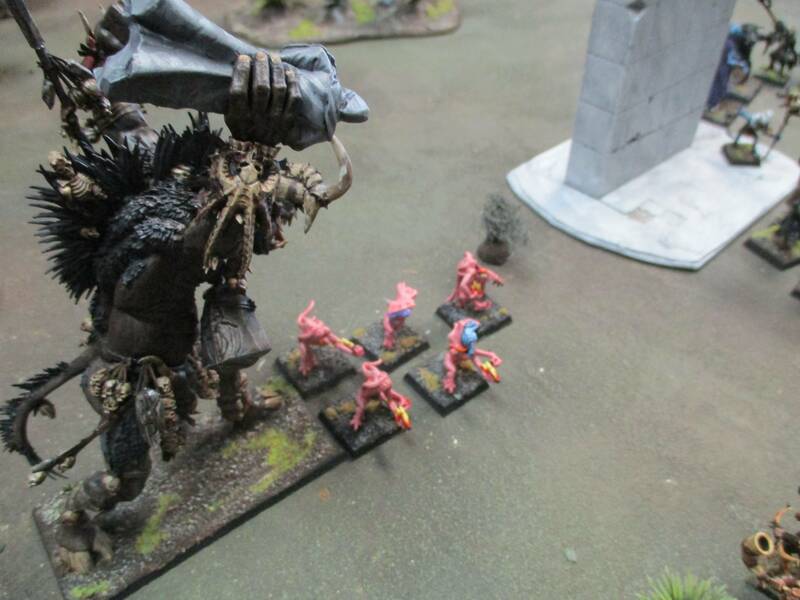 He stabbed at the two remaining beasts with his staff but the first one's massive axe slammed down into his leg and Magach felt his thigh bone split lengthwise. A massive cleaver caught him in the side and lifted him from the ground and he slammed into the white wall behind him, his intestines stuck to the wall as he slid down it pulling them further from his body. He lay in a heap at the base of ruin and was granted the mercy of seeing his murderers engulfed in green warp fire before they strode from his view. 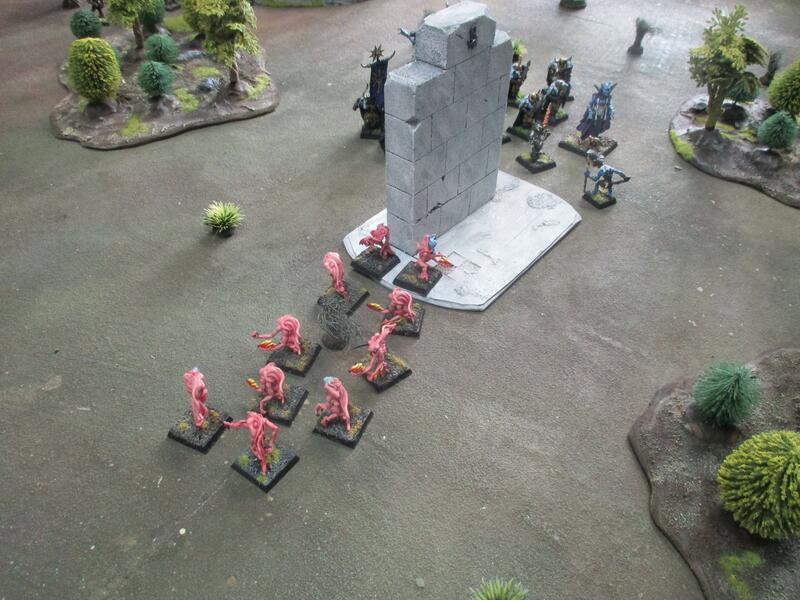 The air glimmered with the magic swirling through it and forming beings, all landing around the ambushing brayherd. Trees were starting to catch on fire as the magic flames the daemons sent hurling through the air engulfed them as often as the intended target. 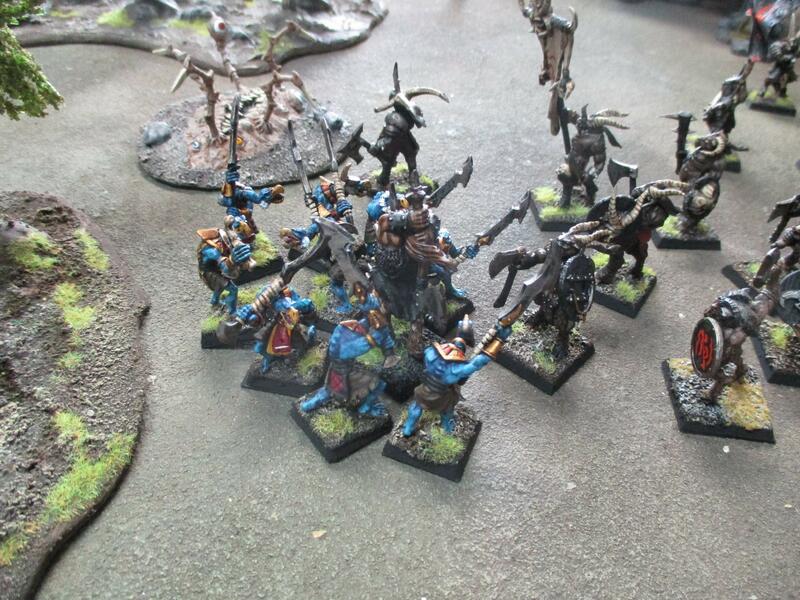 The last thing the Tzaangor shaman heard was the sound of the brayhorn blurting out the retreat. Ghaka must have decided that enough was enough.